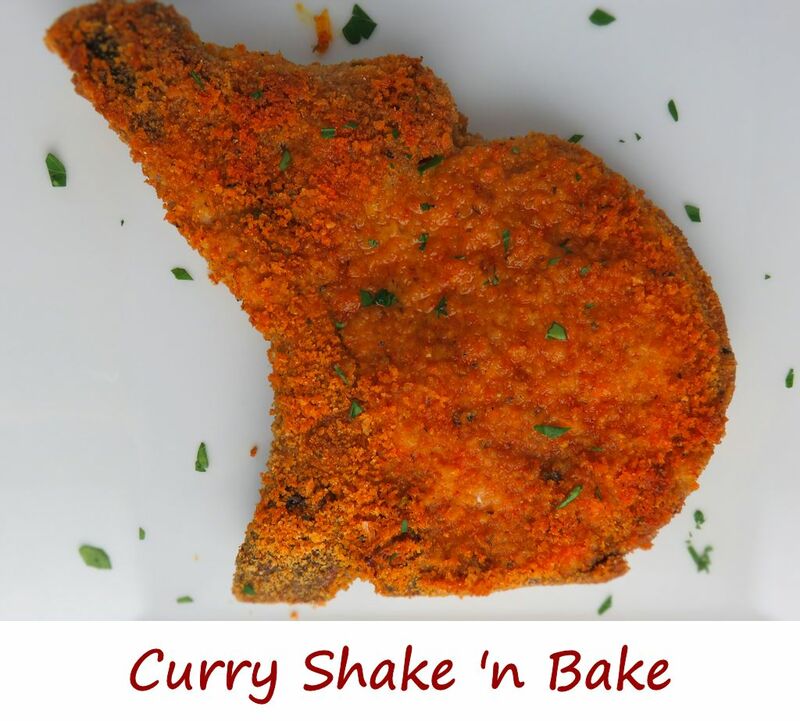 Oh how I do love Shake ‘N Bake pork chops. And as much as they are great made in the oven, I was completely blown away by how fantastic they were cooked in my Char-Broil Big Easy. Crazy tasty, the chops were unbelievably moist and tender. Every bite was so good, I hated coming to the end. Well, except that I saved the bone for last. You can’t have a Shake ‘N Bake chop and not gnaw on the bone. It’s almost a law. You could use boneless chops, but bone-in have much more flavor. I used 3/4″ bone-in chops, which took just over 20 minutes to cook to 160 F. I cooked the chops in Bunk Bed baskets lined with foil for easy clean up. Depending on the size of your chops, you might be able to cook two at a time per basket, but don’t crowd them or they won’t cook completely or consistently. If you use multiple bunk bed baskets so you can cook multiple chops at once keep in mind that each level might cook at a different rate. Try to use same-thickness chops on each level so they all finish at the same time. You can use any flavor Shake ‘N Bake you like. Read the package instructions to decide how much you’ll need for the chops you have. I prefer my homemade chipotle Shake ‘N Bake. It takes just like the classic mix, but with a nice little smoky kick. I like my pork chops with a crispy side salad topped with croutons that I also made on my Big Easy. 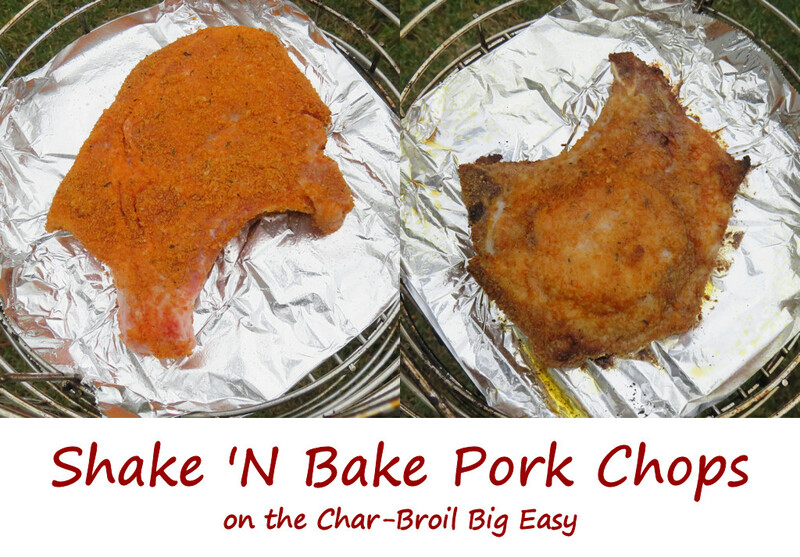 You can cook only one large pork chop (or maybe two small ones) at a time in the Big Easy basket. But, with a little finagling you can also add up to three Bunk Bed Baskets, giving you room for four large pork chops at once. Note that the chops at the top of the basket may cook at a different rate than those at the bottom, so start checking the temperatures after 20 minutes for chops that are around 3/4" thick. Thinner chops will of course take less time and thicker ones will take longer. Working one at a time, place a pork chop into a resealable bag containing the Shake 'N Bake mix. Seal and shake until coated. Alternatively, pour the Shake 'N Bake out onto a plate and press the chop into the mixture, flipping and pressing the other side to also coat it. Line the Big Easy basket and any bunk bed baskets with foil. I sprayed mine with non-stick spray but I don't think it's absolutely necessary. Cook for 20 minutes then check the temperature in multiple places. The minimum safe temperature is 145 F, but I personally aim for 160 F as measured in several places. Remove from the Big Easy and rest 5 minutes before serving.